Last Friday's (4/27) SPC outlook with a moderate risk and strong tornadoes expected in central and eastern KS did not really verify (there were only 2 or 3 very brief EF0 tornado reports with no damage). Looking back, this case was a good example of a narrow warm sector where, although ingredients (CAPE and wind shear) looked very supportive of supercell tornadoes, storms persistently formed too close to a surface stationary frontal boundary. 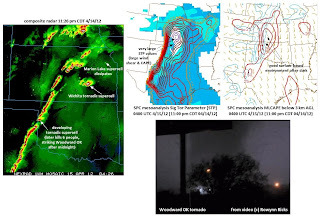 They moved across it and into a cooler surface environment where they rapidly became elevated supercells (not surface-based), with the only lifted parcels that could produce CAPE/instability coming from well above ground, which worked against tornadoes. To illustrate this, the first graphic above shows surface-based (SB)CAPE and storm-relative helicity (SRH, low-level wind shear) from the SPC mesoanalysis at 7 pm CDT when a tornado-warned storm was moving into Topeka KS from the southwest. Notice how far north of the surface warm sector (indicated by SBCAPE) this cell was located. As seen from the Topeka Rapid Refresh sounding at the same time (2nd graphic above; no observed sounding was done due to ongoing severe weather), this environment was clearly elevated, with no CAPE from lifted parcels near the ground. Even though SRH was quite large, it is difficult for tornadoes to develop in such an elevated setting north of a stationary surface boundary, and any tornadoes that could manage to develop here would be weak and very brief. Because supercell storms could not spend much time in the surface-based warm sector before crossing the stationary boundary into much cooler surface air, the supercell tornado threat as originally anticipated could not materialize. 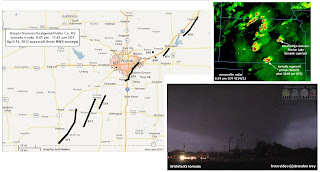 The Saturday before (4/21) in the northern plains saw another type of boundary generate a surprise round of weak (EF0-EF1, see storm report map and photo above) tornadoes in western Minnesota that were not expected. These were non-supercell tornadoes that developed from enhanced stretching processes along a sharp north-south surface wind-shift boundary that provided vorticity for spin. With very cold air aloft, a vertically compact area of CAPE (see the sounding above) developed from surface heating accompanied by very steep low-level lapse rates. Both of these factors increased the potential for strong low-level stretching as storms formed along the surface boundary, which resulted in several tornadoes that did some damage to farmsteads. Notice on the SPC graphics above that the overlapping of steep low-level lapse rates with low-level CAPE suggested very well the enhanced stretching environment along and just west of the boundary (see my paper with Jim Caruso here). This was also indicated by the SPC Non-supercell Tornado parameter (also shown above), which incorporates these same ingredients. So, 4/21 was an example of a different type of boundary that helped rather than hurt tornado potential. Fortunately, difficult-to-forecast events like these usually produce generaly weak tornadoes and don't happen that often. One certainly would not expect tornadoes in April with northwest flow aloft and surface dew points only in the 40's F (quite unusual!!!). But a look back shows that some required ingredients for non-supercell tornadoes were there. 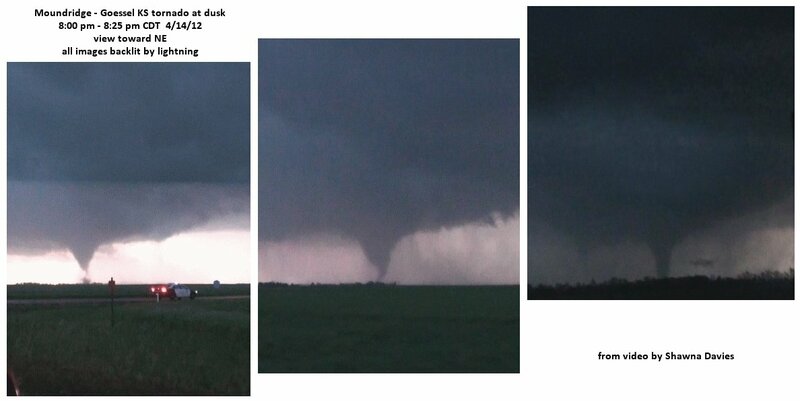 Much has been written and many photos posted from last week's major outbreak of tornadoes on Saturday April 14, 2012. The most damaging and deadly tornadoes turned out to be after dark, including the EF3 tornado that hit the southeast side of Wichita KS ($140 million damage), and the EF3 tornado that struck the Woodward OK area around midnight killing 6 people. 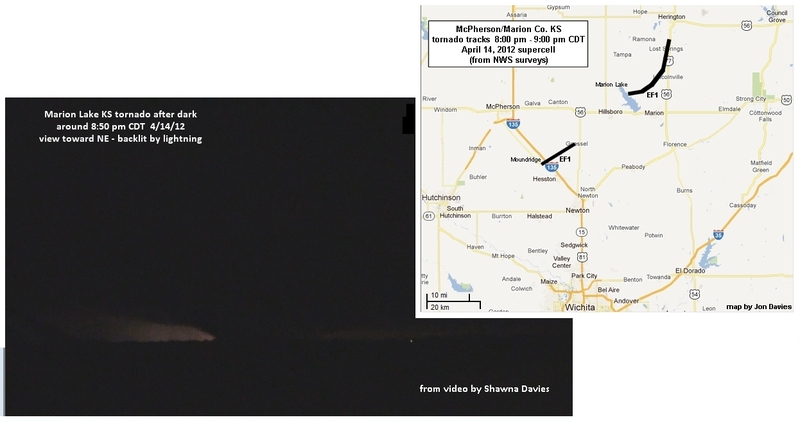 Above, grabs from video by my wife Shawna near and after dark in the Moundridge-Goessel and Marion areas of central KS show tornadoes visible only by lightning, including a large one near Marion Lake. Associated maps and radar images above also show the tornado paths from that supercell, as well as the more prolific supercell that struck Wichita around 10:20 pm and produced other tornadoes before and after, also after dark. 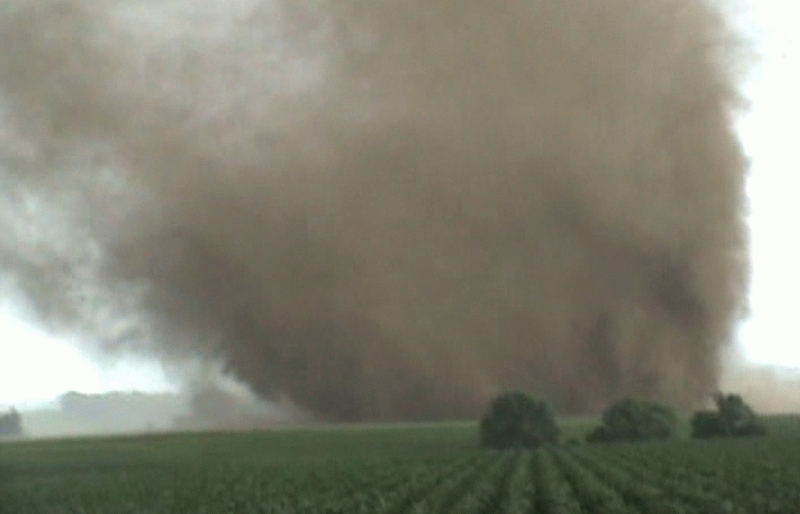 Tornadoes after dark are particularly dangerous because they are difficult to see, and many people are asleep and not aware of what's approaching. My paper with Andy Fischer about nighttime tornado environments (see here) shows that tornadoes after dark in the Plains occur when both CAPE and especially low-level shear are large after sunset. Just as important, storms after dark need to remain relatively "surface-based" (lifted parcels of air near the ground that feed updrafts are able to move upward with little resistance). This occurs when surface temperatures don't cool much and surface dew points remain steady or even increase, keeping convective inhibition (CIN) relatively small, rather than the more typical scenario where storms become "elevated" above a cool stable layer near the ground when surface temperatures cool significantly after sunset. CAPE below 3 km (CAPE closer to the ground) can also be an indicator of a more surface-based environment. Notice that in the 2 graphics immediately above, along with large CAPE-shear combinations (suggested by both the Sig Tor parameter and the energy-helicity index), there were significant amounts of low-level CAPE indicated after dark on both the SPC mesoscale analysis in real-time, and on model forecasts in advance. 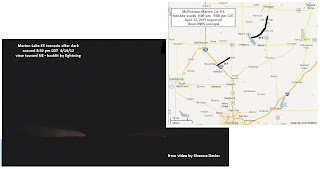 This suggested a continuation of the April 14 tornado event well after dark, which was the case, particularly with the Wichita KS and Woodward OK tornadoes. Obviously, with this big an outbreak, it is very fortunate that more people weren't killed. I can't emphasize enough the excellent forecasts and outlooks several days in advance, as well as pin-point warnings and media coverage during the event. When I get time this coming week, I'll do a post about the setting that generated tornadoes in Minnesota yesterday (4/21/12) with early spring northwest flow aloft and 40's F dew points at the surface (very unusual!). 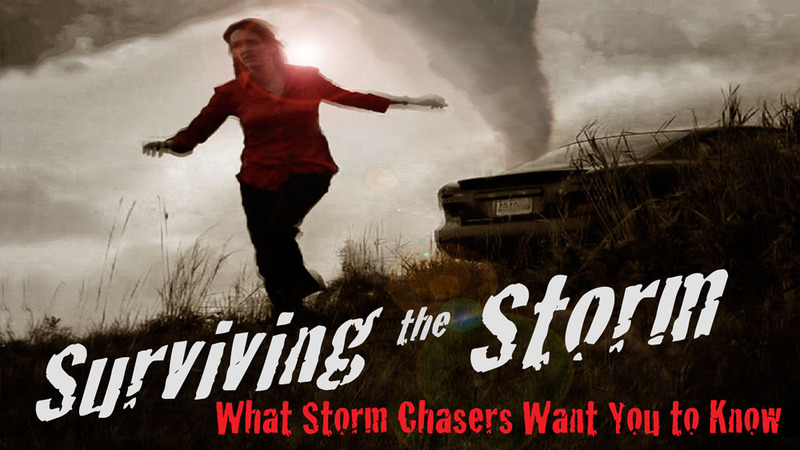 "Surviving the Storm: What Storm Chasers Want You to Know" DVD now available! With death and injury tolls from tornadoes in 2011 that were staggering, a group of professional storm chasers decided to use their considerable experience with violent weather to make an instructive and entertaining DVD to help people save their own lives when severe weather strikes. This DVD is titled “Surviving the Storm: What Storm Chasers Want You to Know”. 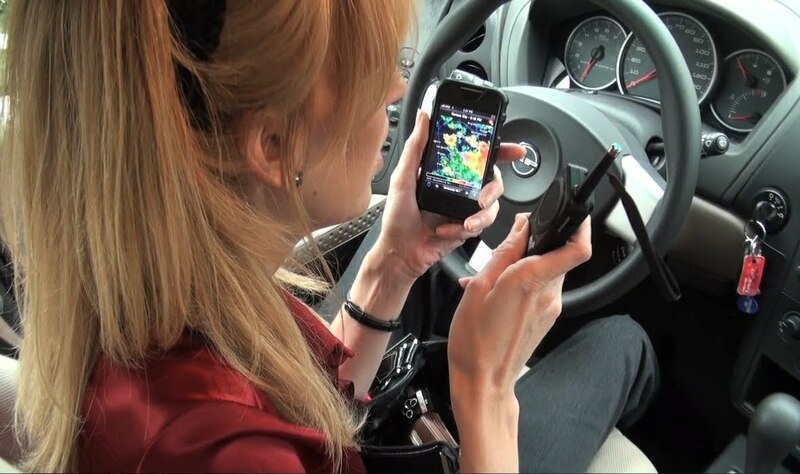 This 30 minute program provides life-saving tips and strategies for individuals and families to protect themselves against all types of severe weather... Safety segments show how to increase survival chances when violent weather strikes both indoors and out, including on the road. 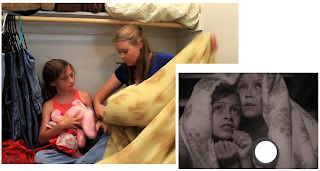 In addition, on-the-street interviews quiz people about severe weather knowledge with humor and wit, and a heart-pounding finale shows a mother and daughter acting to save their lives as a tornado strikes their home. Through use of exciting storm chaser footage and re-enactments of life threatening situations, this DVD offers an abundance of knowledge to survive deadly storms and severe weather. With what appears to be a several-day period of severe weather coming up for the Plains during April 12 through April 16, now seems an appropriate time to announce this DVD. Please buy a copy and let your friends know about it, too. After a deadly year of tornadoes and severe weather in 2011, we really want people to be aware and prepared in 2012!